The cover doesn’t quite match up with the story inside, but it is still a beautiful cover and definitely a contender for cover of the month. Just the whole thematic idea of it, which is reflected in the story, makes it good, but of course the execution also matters a lot and in that department Stephanie Hans is a genius. The story itself takes place some time after the events of Infinity towards the end of which Attilan, the floating city of the Inhumans, self-destructed and its wreckage crashed in New York. One of the side-affects of this crash was that the Terrigen Mists were loosed all over the world. They spread and awakened latent Inhuman genes in people everywhere. But that is not all of course. In keeping with the aftereffects of the Battle of New York as seen in Marvel’s Agents of SHIELD, some Inhuman tech also made its way to New York as part of the wreckage. And it is this that Superior Spider-Man ultimately has to deal with. The episode of the show that dealt with a piece of Chitauri tech being found by a fireman is one of the better episodes because of its deeply personal story and how it all exposed the relationship between Agents Fitz and Simmons. Writer Christos Gage does something very similar here. 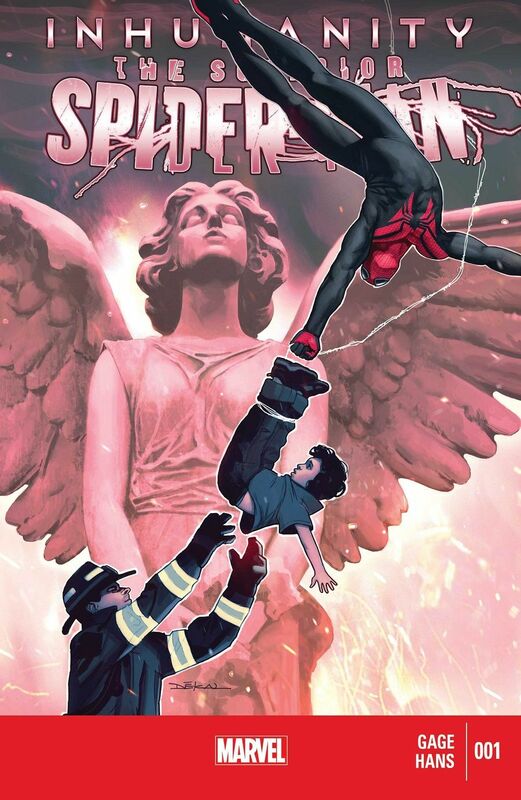 He explores the humanity of Superior Spider-Man. At the end of the Arms of the Octopus crossover last October, we had SpOck wondering what his life would have been like had he gone down a different path when he was still Doctor Octavius. It was a personal sendoff and Mike Costa handled that well. With this issue, we see how those same thoughts still linger for the character. He wants to be a hero who is better than Peter Parker ever was. He is always striving for that in his new life and role. This is one of the issues that goes to the core of such and plays around with the whole idea. SpOck’s arrogance and snide commentary is in full effect in this issue and that, more than anything, shows how this is still SpOck and helps to differentiate from Peter Parker and his brand of witty remarks. But, at the same time, we see the true hero underneath the garb of a former villain playing at being a hero. It is stories like this that have really sold me on the concept of Superior Spider-Man. It is such a different take on these kinds of stories. Christos Gage is no stranger to the character since he’s written an Annual for him last year and has even co-written some of the main series issues with Dan Slott. It amazes me how well he can write the character in all sorts of different situations. That’s definitely the mark of a good writer, I feel, being able to switch so seamlessly and write some great stories. Stephanie Hans’ artwork is absolutely amazing. In fact, it makes me want to buy the issue despite the pricey tag for a one-shot like this. She experiments with a ton of perspectives here and the way that she draws SpOck is great. There are a couple panels where the scene as set out is somewhat confusing but 99% of the time she’s just incredible. The first page is a double splash page that evokes a very pulpy post-disaster scene and that first page itself sold me on her art. I knew then that I was in for a hell of a time. And I truly was. I would love for her to do more SpOck issues or more one-shots for Marvel at the least. She’s got a great kinetic style that I enjoyed and want to see her take on more characters. It also helps, overall, that there is a more… human character in this issue as well, a fireman named Coyle. He plays a very important role in the story and its nice to see that Christos Gage moves between him and SpOck quite effortlessly, giving them equal page-time. More Superior Spider-Man: Annual #1, Superior Spider-Man Team-Up Special #1. Posted on January 28, 2014, in Comics Reviews, Review Central and tagged Christos Gage, Comics, Comics Review, Event Comics, Infinity, Inhumanity, Inhumanity: Superior Spider-Man, Inhumans, New York, Otto Octavius, Review, Review Central, Spider-Man, SpiderOck, Spock, Stephanie Hans, Superior Spider-Man, Terrigen Mists, Thanos, VC's Clayton Cowles. Bookmark the permalink. 10 Comments.